This week's episode of WWE SmackDown saw John Cena return. During his promo, Cena called out a Superstar from the back to come down and meet him in the ring and his call was answered by Becky Lynch. This situation ended with Lynch and Cena teaming up to face Zelina Vega and Andrade 'Cien' Almas. During the match, John Cena hit Andrade 'Cien' Almas with the Attitude Adjustment followed by the 6th move of doom. Lynch didn't take kindly to this and threw her own tag-team partner out of the ring before locking in the Dis-Arm-Her on Zelina Vega and making her tap. 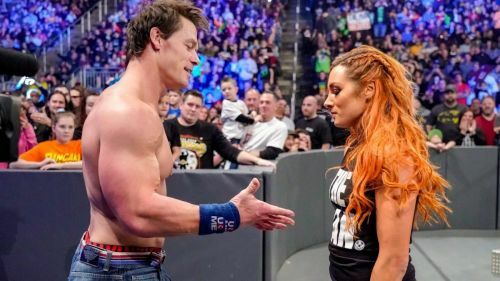 After the match, Cena and Becky Lynch faced off again at ringside as Cena gave her a nod and reached out for a handshake. However, Becky did the 'You can't see me' hand gesture instead and walked away. In this article, we look at the possible reasons why WWE had Becky Lynch throw Cena out of the ring. 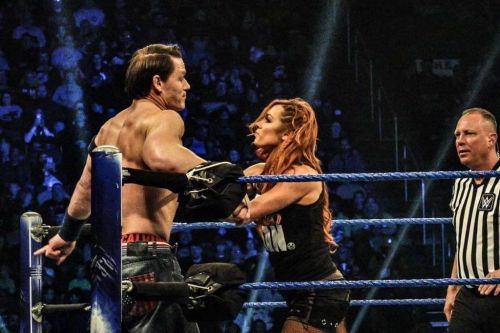 It's no secret that John Cena is a big fan of 'The Man' Becky Lynch. The 16-time Champion may be busy with his Hollywood career but he still keeps in touch with what's happening on WWE television. In the past, Cena has spoken highly of her and gave her a shout out on Instagram. "I found my voice in 2018. That simple, powerful thing left the rest scrambling to catch up. In 2019 everybody better step up because nothing or no-one is going to hold me down again."